Zydrunas Ilgauskas is ready to play with the bigger boys again. He has been playing one-on-one against Cavaliers general manager Danny Ferry since he was cleared to practice last week. Ilgauskas said he went through the entire practice on Monday — fast-break drills, a lot of shooting, two or three defensive drills, four-on-four transition drills and then extra shooting. 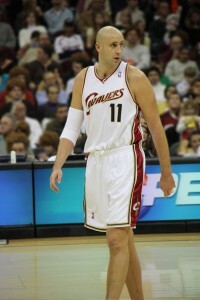 Ilgauskas initially sprained the ankle defending a shot by former Cav Donyell Marshall at Philadelphia on Dec. 10. He tried to come back at Denver on Dec. 19, but the ankle didn’t get any better. Eventually, it was discovered that he had chipped a bone, so the Cavs shut him down for almost four weeks. “It was nice to have the big fellow back out on the court,” LeBron James said after practice.